Who’s the Dark Brown Duck? – Let's Paint Nature! In this picture from Lake Katherine I have a male mallard (right) with a head injury (see next picture), but the duck to the left I’m not sure about. It looks too dark to be a female mallard. Does anybody know what it is? These two were inseparable. Any help would be great. Thank you! Here is a close up of the male mallard’s head. Maybe a hawk took a swipe at him??? I don’t know. Around the DuPage River, West Branch, in Warrenville we have had many hybrid ducks, and last year had a whole ‘family’ of those brown ducks with the mallard head. This year we have some that are almost white on their backs with mallard heads, and there also are some with white chests and mallard heads. Two of the latter are ‘inseparable’ with a ‘normal’ male mallard, and have been for the 4 years I have observed them. I suspect the hybrids of being infertile or else, hmm, some other sexual deviation??? A friend (a duck hunter) said he thinks the brown duck looks like a hybrid and probably is the female in the pair. As such she may be sterile. It has the head and bill of a mallard but not the body. 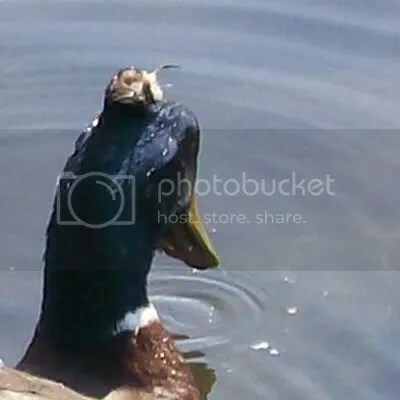 Ducks (particularly those you see in the public parks & such,) tend to hybridize pretty freely, creating all kinds of new “looks.” As for ducks with tufts on their heads, those tend to be the results of mating battles. Judy: Your hunter friend not only helps me learn something new, but helps a whole bunch of others wondering the same thing! Thank you and thank your friend for us too!!! Dawn: Yes, makes ya want to kiss him doesn’t it??? Update: Another duck hunter from Michigan told me that they have ducks that look like that. They call them Canal Mallards, and are the result of cross-breeding of a mallard with a Muscovy duck, so they can be quite odd-looking. Brown usually indicates female, he said. But a duck which has a curled tail feather coming up in the center of the tail feathers, is supposedly male. The two ducks in your photo seem to both have those curly “drake feathers” so hmmm…. 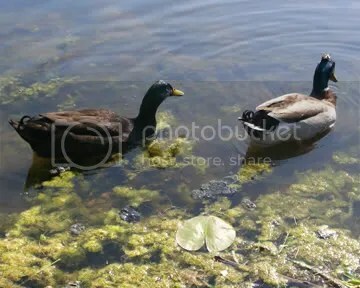 the duck on left looks like a black duck or also called a moltted duck. Thanks Mary! That was a lot of great info. I think i know what happened to his head. I recently witnessed a mink do the exact same thing to one of my ducks…..they grab them by the head and pull them under….i watched it….and still couldn’t believe my own eyes!